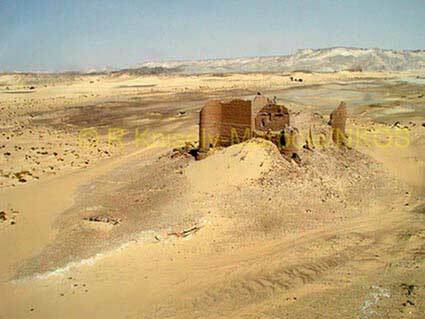 The access to the Darb Ain Amur, leading west to Dakhla via the small oasis of Ain Amur, was guarded by the imposing fort of Ain Lebekha, to which a compact and well-built settlement was associated. To the north of the fort lies an impressive temple, built on a natural outcrop, and a necropolis, which includes some of the most elaborate tombs in the oasis. Less imposing tombs are located to the south and the west of the settlement. Another, more ruined temple lies to the north-west of the fort. The fields of Ain Lebekha were once watered by a system of qanats. At present one of them, cleared of the debris that clogged it, provides enough water for a small farm.